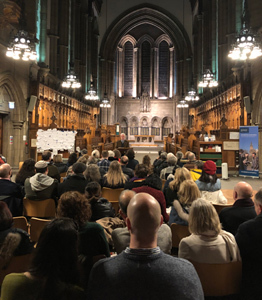 SCoJeC was delighted to support the launch of a new book by our Projects and Outreach Manager Fiona Frank, in Glasgow University Chapel, on the last weekend of an exhibition of the work of her late aunt, the artist Hannah Frank. Fiona's book, Candles, Conversions, and Class: Five Generations of a Jewish Family, is based on her research for a PhD at the Scottish Oral History Centre, and studies five generations of descendants of Rabbi Zvi David and Sophia Hoppenstein, who arrived in Edinburgh in the 1880s and had nine children. Fiona tracked down and interviewed their descendants throughout Scotland, England, and as far as Cape Town, and found that in the 21st century, some of the family live fully observant Jewish lives, others consider themselves Jewish but secular; while others have completely lost the connection with the Judaism of the first immigrant generation. 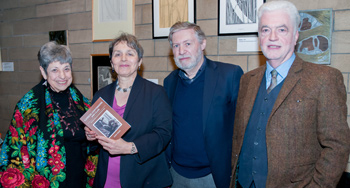 Apart from Fiona, other speakers at the launch were former SCoJeC Chair Kenneth Collins, who is now Chair of the Scottish Jewish Archives Centre, which published the book; writer and broadcaster Billy Kay, who published an interview with Moss Stone, Zvi David and Sophia Hoppenstein's youngest son, in his book Odyssey: Voices of Scotland's Past; Ivor Kallin, a third-generation Hoppenstein who was interviewed for the book; and Fiona's PhD supervisor Prof Eileen Yeo of the University of Strathclyde. SCoJeC sponsored a kosher buffet, and klezmer music was provided by Glasgow's The Bunch of Klezmer with guest Simon Carlyle on tuba. Fiona said: "I'm absolutely delighted with the evening. The speakers, venue, refreshments and atmosphere were all fantastic and provided a fitting end to a journey which started for me back in 2000 almost accidentally with my very first interview. "I was interested in education and I interviewed my uncle Lionel, Hannah Frank's husband, about his memory of his first day of school, several years before I thought about doing a PhD about Scottish Jewish identity. He spoke to me about his very clear memories of being "what's the word? – threatened, assaulted, by children at the neighbouring school. They would like to get hold of you and say 'are you a Billy or a Dan?" A Billy was a Protestant and a Dan was a Catholic. I asked my uncle, "So where did the Jews fit in?" and he replied: "They got it from both sides – they were kind of impartial". "In 2004, when I decided to start the PhD, I ended up alighting by chance on the Hoppenstein family as a very interesting family to study. When I started my training as an oral historian with Bill Williams at Manchester University, the first two Scottish Jewish people i interviewed at that time happened not only to be members of the same family, but they were also related to my uncle Lionel – they were all descendents of Rabbi Zvi David and Sophia Hoppenstein. So I decided to try to trace all their living descendents to see what had happened to them." Fiona will also be speaking about the book, and her research in Lancaster (13 February 2019) and London (8 April 2019). Click here for more information about these events.